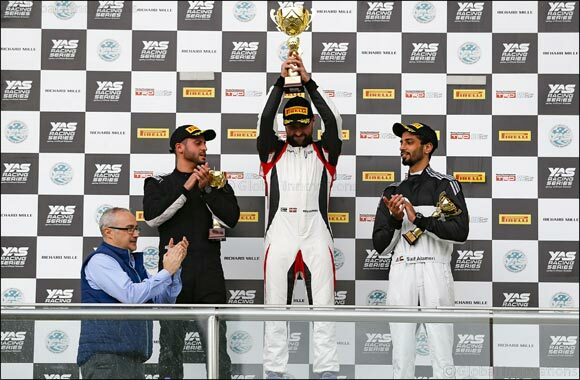 Yas Marina Circuit, Abu Dhabi, March 18, 2019: Yas Marina Circuit on Friday saw another outstanding day of local motorsport, as Spaniard Kepa Carmona sealed his victorious season in the TRD 86 Cup. Despite garnering 20 points from Race 1 and crashing out in the lead of Race 2, this was enough to boost Carmona’s overall season points tally to 248, putting him at the top of the final driver standings for Season 5 of the single-make local racing championship. Beating fellow Gold Class competitor Ahmad Al Moosa by only 6 points over the course of the championship, and last year’s winner Saif Al Ameri by 40 points, he was crowned TRD 86 Cup champion 2018-2019 at the inaugural Awards Presentation on Friday evening. Reema Al Juffali, the first TRD 86 Cup female driver, came fifth on the day but fourth overall on the season leaderboard, putting the cap on what has been a consistently strong performance across the rounds. Her first season competing in the series brought her to the attention of the wider international motorsport community, and it was recently announced that she would be leaving the TRD 86 Cup after Friday’s race and will join Double R Racing in the UK Formula 4 championship later this year. Marwan Al Rahmani took 52 points over both Friday races, which saw him taking third place overall with 226 points accrued over six rounds and earned him the Silver Class category winners’ laurels in 2018-19. The UAE’s Abdulrahman Al Hosani led the rest of the field with an overall placement in sixth (86 points), followed by Franco Calzolari from Italy with season total of 72 points, and then: Hamad Al Mazrouie (UAE - 46 points), Yan Vitchen (France – 40 points), Salah Al Amoodi (UAE – 28 points), Alqassim Hamidaddin (KSA – 20 points), Mohamed Al Qubaisi (UAE – 20 points), and Italian Matteo Bigogno with 10 points. Season 6 of TRD 86 Cup 2019/2020 was announced on Friday night at the glamourous awards ceremony with a detailed calendar to be confirmed at a later date.